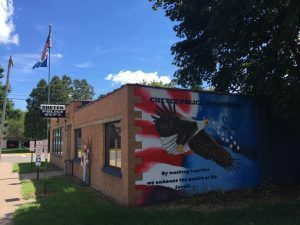 It shall be the mission of the Chetek Police Department to provide professional Police services to all of our citizens and visitors. The members of the Chetek Police Department are committed to preserving the peace while evenhandedly and uniformly enforcing the law. We will partner with our citizens to protect life and property, prevent and deter crime, assist those in need and create a safe environment in which to raise our children. By working together we enhance the quality of life for all. The Chetek Police Department provides 24 Hour coverage 365 days a year rain or shine. We are staffed with four - six full time officers, two part time officers and an administrative assistant who is also the Municipal Court Clerk. We are proud of the job we do and the services we provide. Our doors are always open and we welcome input from the citizens we serve. The Chetek Police Department has a positive working relationship with the Chetek-Weyerhaeuser School District. We are very serious about maintaining a secure and safe environment for our children. (715) 924-3686 is our normal police line, if not answered you will have the opportunity to leave a voice message. Please view the following Methamphetamine Resource links to find out more about the drug.